I'm a bit retentive – if there is a set of things to collect, then I need to have the whole collection. I'm an unashamed geek – I love technology and gadgets. For these reasons, as soon as I learnt about Fitbit, I knew I had to have one. What could be better? A little device that links to my food consumed and exercise apps, counts my steps, monitors my sleep and then, links to my iDevices and provides me with funky dashboards? And achievement badges? And lets me compare myself to friends? Hello! I am in geeky device heaven! "But, you're a sensible sort," I hear you say, "so why did you spend an obscene amount of money on a glorified pedometer Lisa?" I won't lie. 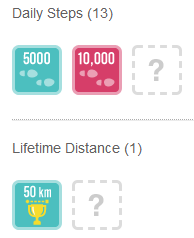 Like FourSquare which sucked me into visiting places and checking in to earn badges and free samples, Fitbit has done the same with their achievement badges. That, and I can compare my stats against friends, and what inspires people more than a little real-time friendly competition? I'm not a particularly fit person anymore. I'm not fat by any means, but nor am I fit. Post baby, I just want a little motivation to get moving. I used to be quite active and since Ellie came along, quite active now means "I carried her around and did a few lunges at the same time today" instead of "I cycled 100km today". So I need a push to get moving. I was tossing up between the Flex and the One, and in the end, while the One has more features at the same price point ($119), the Flex won out because I can wear it all the time without having to remember to transfer it between outfits. It records a bunch of cool stuff: distance travelled, number of steps, calories burned, and sleep quality. It's extremely minimalist. It looks like one of those charity wristbands and 5 little lights tell you how you're tracking along against your daily step goal. I've had the device a week now and I've only needed to charge it the once, so I'm getting well within the stated 5-7 days of battery life from mine. It even syncs in nicely with apps I already use such as myfitnesspal and runkeeper. So although it doesn't have the best food tracking system or a GPS onboard, I can use other apps to do that, and it accepts the data onto the dashboard when I sync. I have to remember to turn it over to sleep mode but even that isn't too much of a hassle, just tapping a few times on the band. It doesn't bother me to wear it while I'm sleeping, and that data collected is pretty neat really – I can see when I went to bed versus when I woke up, and also how many times I was restless each night. The silent alarm gets a round of applause from me – it's a nifty concept that it awakens me by vibrating quietly. Mr Fork appreciates it I'm sure, as I generally wake before him and now he can actually sleep in until his own alarm goes off. I am curious about the statistics. I mean, what constitutes "very active minutes" and "restless" while sleeping? If I roll over, or scratch my nose, is that restless? If I jog on the spot, does that count as a step? What about if I wave my arm up and down? Despite my questions, once I'd calibrated the device, I have found it to be relatively accurate. I compared by counting steps manually and then comparing the results to the measured statistics. I can see where I walked to the bus stop and went to get lunch, and even when I stirred at night when Ellie cried out. Although, when I set my daily goal, I added an extra 10% to what I wanted to achieve as I figure it tracks an awful lot of erroneous gestures when I wave my arms around. It's an encouraging and friendly little device. When I sync to my phone and I'm close to a goal, it lets me know. 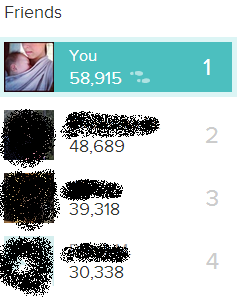 It tells me when friends are catching up (or I'm catching up to them) and the allure of badges is pretty sweet, such as the 5000 and 10000 steps, or 50km. I find if I'm close to hitting a big number like 10000 for example or nearly caught up with the person in front of me, after Ellie is in bed I'll pace around the house trying to get my count up. I make sure I go for a stroll around the office so I don't get told off for inactivity. It's sneaky the way I have made exercise more a part of my day simply by wearing my Fitbit! So I think it was a good investment for me. Sure, it's a glorified pedometer. Do I wish it had more features? Absolutely. In the future, I can see that this little device is going to be fantastic. It's going to be a completely ubiquitous fitness tool that everyone wonders how we ever did without it. But now, I'm addicted to the badges and the friendly competition. Had it not been for those friends, sure I mightn't have been walking laps around the veranda while I checked my Facebook updates but on the other side of the coin, I walk a lot more steps than I thought I did! For me, a fitness band should be ubiquitous. If it senses when I'm moving, why do I need to tell it when I go to sleep and wake up? The Fitbit should detect this and record appropriately. Borrow some features from the Jawbone Up. If it can tell when I'm restless, then wake me at the appropriate spot in my REM cycle if it's within say, a 10 minute window either side of my programmed silent alarm. I'd love to be able to count my stairs as well, so is there any way to fit an altimeter in? The designers missed a golden opportunity to use the charging cable to also sync the device. I mean it's plugged into the computer already, why not sync then too? Why can't I export my statistics from the dashboard? Please bring in some decorative accessories! A black plastic band doesn't go with a cocktail dress really, but why should it be one or the other? I'd love to see a dedicated iPad app instead of having to use my iPhone one. Do you have a Fitbit? If so, add me and we can be fitness friends!